If I Wanted to Limit Myself to ONE Setup Only! I get asked from time to time which of my setups is my favourite, or which I would choose to trade if I had to limit myself to one setup only. I really hesitate to answer this question, because I'm a firm believer that the setup chosen at any particular time needs to be the one most suited to the market environment. It reminds me of the saying, "If the only tool you have is a hammer, then you'll treat every situation as if it's a nail". If the only setup you have is the "xyz setup" then you'll attempt to apply it all the time, whether appropriate or not. On the other hand there is some validity to the idea of learning to use one tool at a time. A YTC Newsletter reader, William, has convinced me to share the setup I would choose if I wanted to limit myself to one setup only. But I will caution you, as I did with William, that the most critical aspect is NOT in learning to see the setup but rather in first learning to see the right environment for application of the setup. You need to be prepared to sit through complete sessions with no trades, if that environment is unsuited to your preferred setup. 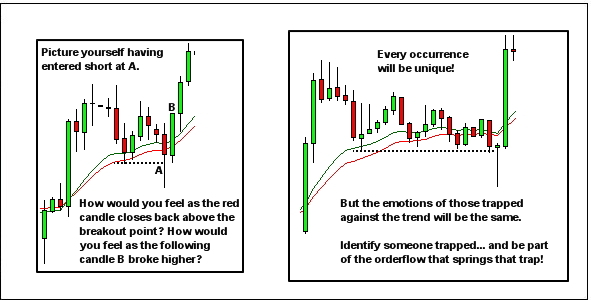 Actual price rarely forms textbook-perfect patterns so you'll find many variations of the above theme. For example swing 2 may crawl along sideways forming a ledge, with swing 3 being a Wyckoff style spring. 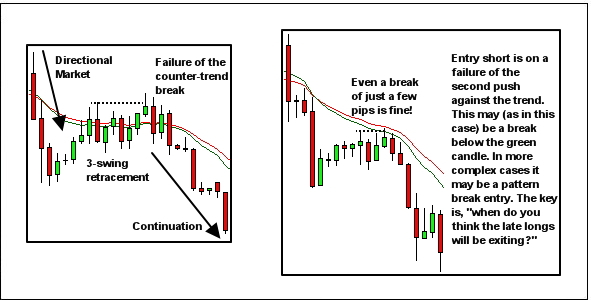 The key element though is some form of break counter-trend, such as occurs above when swing 3 breaks the swing 1 low. Provided you have some form of minor counter-trend break, it's a complex pullback. Watch for the failure of the break for an entry back in the direction of the original trend. 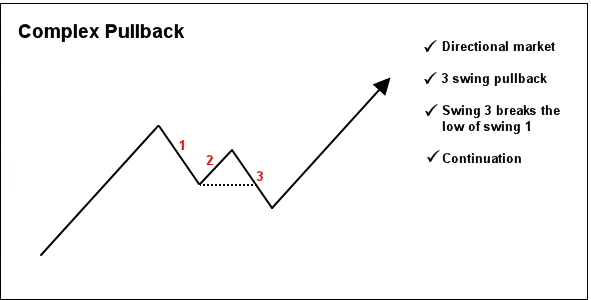 You'll find examples all through my article archives and of course in the YTC Price Action Trader.